Most of Garrapata State Park has been closed since the 2016 Soberanes Fire. 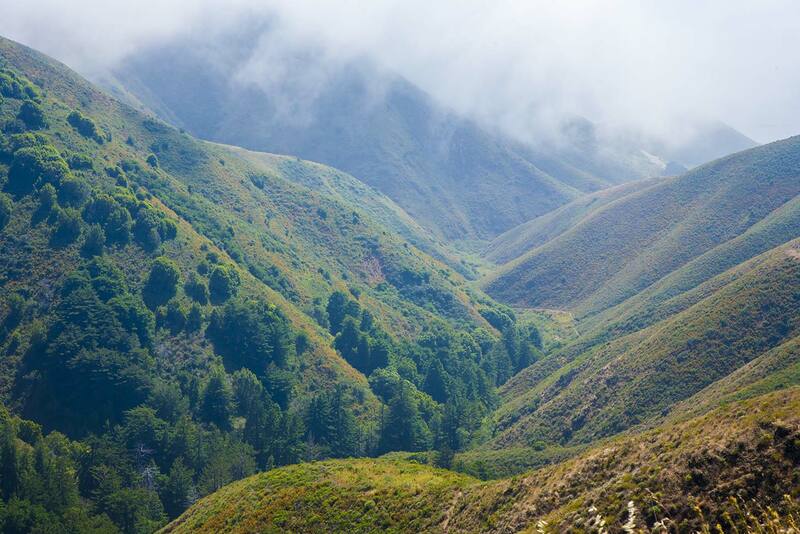 The first 1.25 miles of the Soberanes Canyon Trail has been re-opened, but rest of the trail and the Rocky Ridge Trail are closed indefinitely. 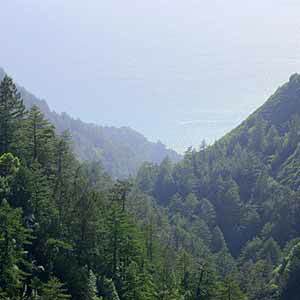 Garrapata State Park is Big Sur’s northernmost park. 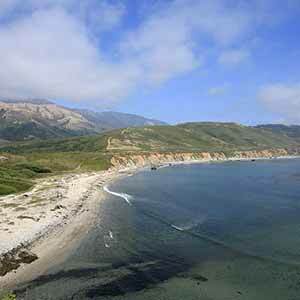 Located just south of the community of Carmel Highlands, the park has high chaparral-covered hills rising steeply above a rocky coastline. Highway One runs through the park but there’s only one small roadsign, and the trailheads and pullouts are unmarked. You can drive right through the park without even realizing that there’s a park and trails there. Throughout, the park is minimally developed and maintained. There is no staff onsite and the only facility is a single outhouse. Garrapata is the foggiest location on the Big Sur coast and is often fogged in even when the other Big Sur parks are clear. Although it’s enjoyable to climb above the summer fog and walk above the clouds, the park is a lot more spectacular when it’s clear. 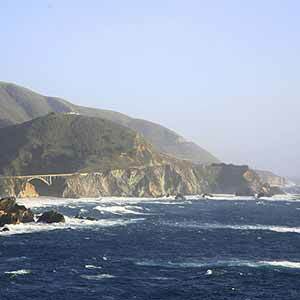 To the west of Highway One, some popular but heavily-overgrown trails lead through low, poison oak-infested chaparral to the rocky beaches and coves. Without any steps it’s a bit of a steep scramble to reach the beaches. To the east of the highway is a single trail loop, described below, that offers really steep gradients, great ocean views, and a small but nice redwood grove. 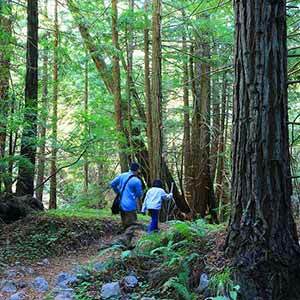 This loop is one of the more extreme examples of the quintessential redwood hiking experience, the descent into a redwood-filled canyon. The eastern half of the Rocky Ridge Trail (the steep descent on the route described below) was closed for several years due to storm damage. As of June 2013, there aren’t any signs saying the trail was closed. 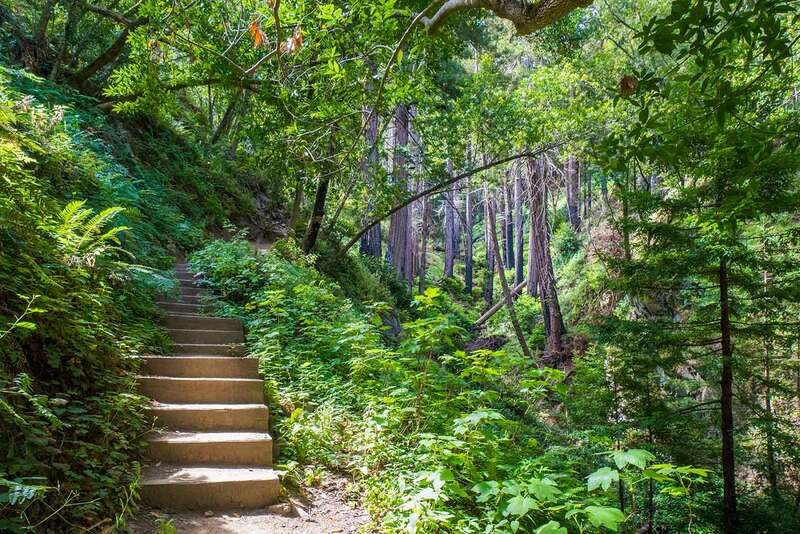 However, the damage hasn’t been repaired: the first few flights of stairs after you enter the redwoods (actually on the Soberanes Canyon Trail) are still washed out. The trail is very steep in this area but there are plenty of handholds and footholds, making it possible to negotiate the washed-out trail. 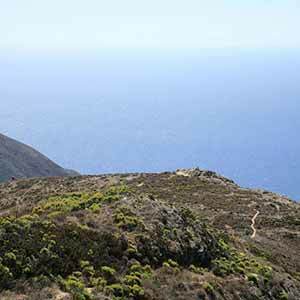 The rest of the Soberanes Canyon Trail has been been restored and is in very good condition. This popular loop starts with a brutally steep climb to a dramatic coastal viewpoint. An even steeper descent into a redwood-filled canyon follows. Except for the upper half of the canyon, the entire hike passes through chaparral, so bring sunblock. There’s lots of poison oak in the canyon, but none at higher elevations. The trail can get overgrown although it’s always easy to follow. Other than an information board at the trailhead and one signpost at the first intersection, there are no signs on the trail. 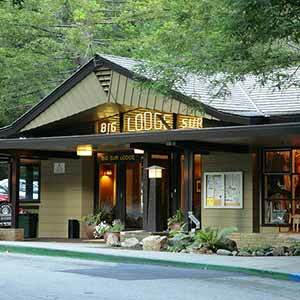 Start at the trailhead on Highway One. There’s no marker visible from the highway, but look for a large pullout under a distinctive row of cypress trees that line the highway. The trailhead is a gated dirt road that leads to an abandoned tin barn. The Rocky Ridge Trail. At the tip of the hill is an overlook with a bench. Past the barn, the trail crosses a stream and begins its ascent. 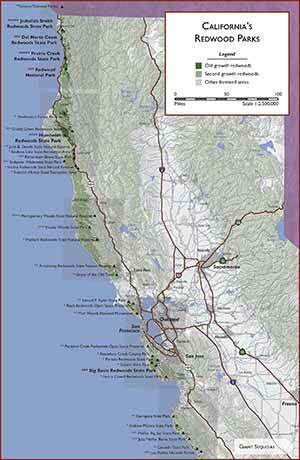 The grade is initially gentle, but then the trail turns away from the coast and the real climbing begins. The trail reaches a ridge and follows the ridgetop to a bench. Past the bench, the trail continues its steep climb. Just after a hairpin turn with a panoramic view, the trail divides. The trail to the left is flat and bypasses the peak. The high route to the right is worth the little bit of extra climbing: it’s much more scenic and passes some of the best views of the hike before descending to rejoin the low route in a saddle. From here a narrower, less-used trail cuts through grasslands to Doud Peak and beyond. The walk to Doud Peak is mostly flat but is a little dull. The ridge is dotted with poppies in the spring and early summer. From the saddle, the trail makes an insanely steep descent into Soberanes Canyon — 0.3 miles with an average gradient of 14%, followed by 0.4 miles with an average gradient of 32%. 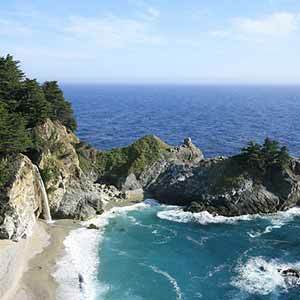 The first half of the descent is particularly scenic, with the redwood-lined canyon far below stretching off into the distance, and the barking of sea lions echoing up the canyon. There are some steps in this area, but they are badly eroded and not much use. The second and steepest half of the descent has no steps. It’s very slow going down the steep, sandy slope, but at least it’s not particularly dangerous - if you slip you won’t fall off a cliff. Still, shoes with good traction are essential, and a walking stick might be helpful. The trail reaches a “T” intersection (marked with a post) just above the redwoods. The overgrown, little-used path to the left leads to a the nicest redwood grove in the canyon. This lush grove, which may be old growth, contrasts strikingly with the miles of wide-open chaparral that preceded it. The grove has lots of mid-sized trees and a burbling stream and is carpeted with an unusually plush layer of redwood sorrel. The undulating trail has patches of poison oak. At one time the path formed a loop, but it doesn’t anymore. The clearer, more-used trail to the right continues to descend steeply, entering the redwoods and briefly reaching the canyon floor before climbing and running slightly above the creek. At the next intersection, the trail to the left descends to the canyon floor and passes through a logged section of redwoods, while the less-scenic trail to the right is cut into the hillside just above the redwoods. The strip of redwoods that lines the canyon floor gets narrower and less scenic, then disappears completely. The trail finally levels out at this point and passes through chaparral (with lots of poison oak) and even a patch of non-native cactus on its way back to Highway One. 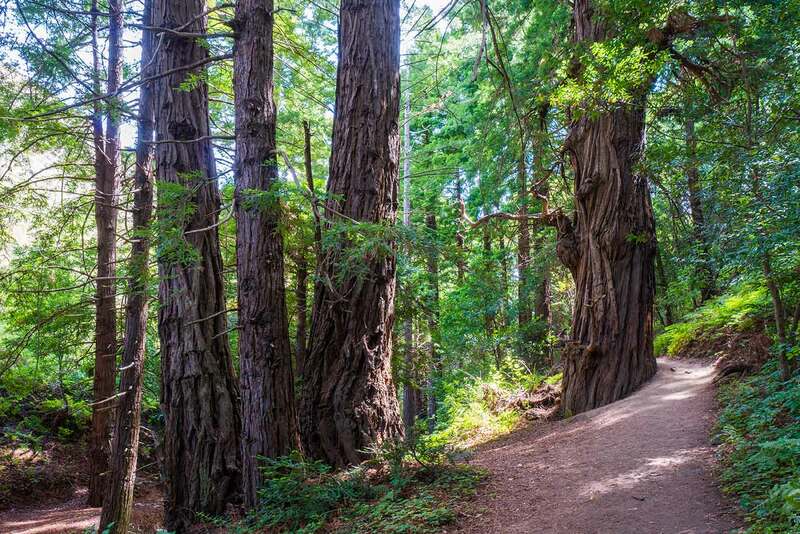 This may be the only trail that has both redwoods and cacti. The Friends of Garrapata Facebook page has some great pictures of the park. BigSurGarrapata.com also has some great pictures, mostly of the shoreline. 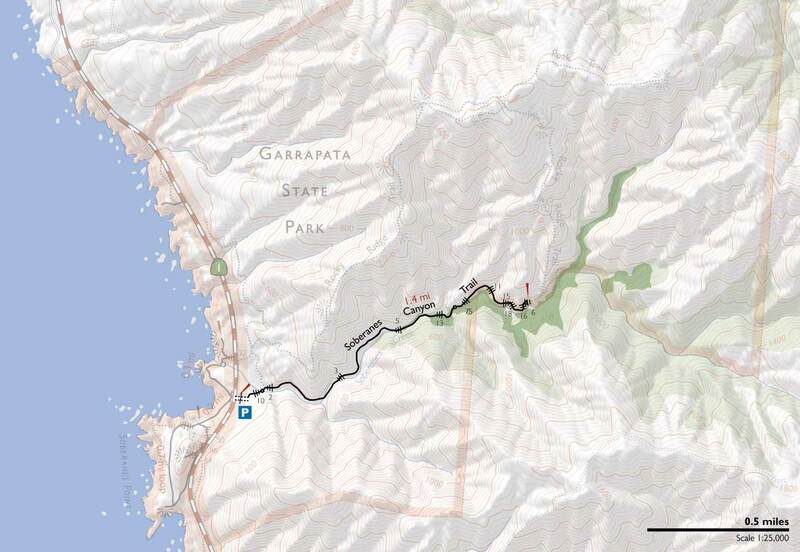 Ventata Wild’s Garrapata State Park page has user-submitted trail condition reports, although at the moment the recent reports don’t offer a lot of detail.